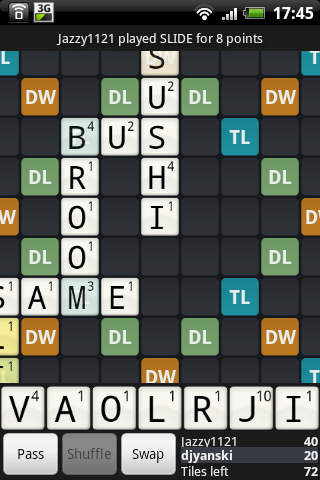 Wordfeud FREE - Scrabble King! Having recently reviewed Words With Friends, our diligent AndroidPIT users were quick to point that there were better Scrabble apps available. Thanks to their tips and expertise, I was pointed in the direction of Wordfeud FREE - an alternative multiplayer Scrabble game with even better user reviews. Wordfeud promises a smoother and more enjoyable Scrabble experience and it is about time we took this game under the AndroidPIT microscope. Find out who wins in the battle for Scrabble app supremacy in today's review. Wordfeud FREE is basically an interactive multiplayer Scrabble game just like Words With Friends and other apps before it. In terms of functions, Wordfeud provides people with the ability to play Scrabble with either your friends or random online opponents. As always the aim of the game is to earn as many points as possible by arranging words on the Scrabble board. At start-up you'll have to create a Wordfeud account by entering in your email address and a username of your choice. The whole procedure is totally painless and takes just a second. After that point you are automatically logged in and you can start playing against other people. Just tap the + symbol to create a new game of Scrabble. Wordfeud FREE provides with some extra options that go beyond traditional Scrabble. Instead of being forced to play on a classical Scrabble board, you can play on a randomized board where the triple and double letter/word square are all over the place. This adds another degree of challenge and can throw experienced players off-guard. It's a small, but useful variation of the popular board game. Wordfeud also allows you to play Scrabble in languages other than English - a useful feature for both native speakers and those wanting to practice a foreign language. Unfortunately, there are only a number of random Scandinavian languages available. Adding such global languages as French, German and Spanish would definitely increase the number of players and be a nice addition. Having selected all of these options, you can either play against a friend or the app can find a random opponent for you. Unlike Words With Friends, Wordfeud FREE lists all your contacts and friends in alphabetical order making it easy to find and add people you know. Personally, I would've loved to see Facebook integration so that I could invite my Facebook friends to play, but this is still missing. You can play several different games at the same time and they are all listed on the main screen. 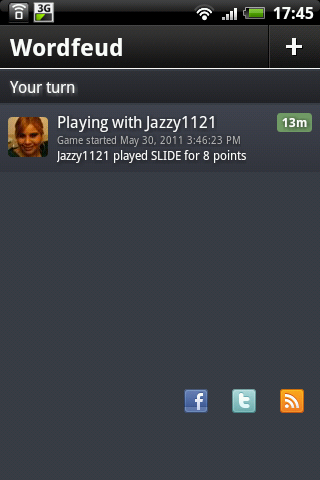 Wordfeud FREE also allows you to add a profile picture to your account - a very cute and useful gesture. As many AndroidPIT members rightfully complained, Words With Friends tended to screw up majorly with its status bar notifications. Wordfeud doesn't fall in the same trap and has a very reliable notification system. 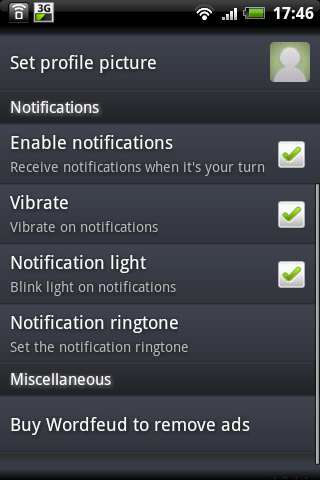 Not only do the notifications work, but they are also fully customizable. You can adjust the ringtone, vibration and light settings to notify you about the moves of your opponents. I have to give credit to the AndroidPIT Community for pointing me in the right direction - Wordfeud FREE may not be as dazzling as Words With Friends, but it definitely performs much better on Android phones. Less clutter, fewer problems and more fun. The layout of the app is very logical and user-friendly. It's not flashy or colorful like Words With Friends, but it definitely gets the job done and is much easier to navigate. The Scrabble board itself is pretty modest looking, but the letters are big and easy to read. Just drag and drop the letters on the board with your finger to create words. Instead of shaking the device, just tap the Shuffle button to mix up the letters. Also, the app lacks pinch-to-zoom, but simply double-tap to zoom in onto the board. As you can see, Wordfeud FREE steers clear of any fancy gimmicks and features and sticks to just the basics. In this particular case, it's actually a good thing. Without all the colorful and flashing graphics, Wordfeud FREE is very reliable and runs very quickly on every single device I tested from old to new. It may take a while for the app to find a random opponent for you, but that has nothing to do with game speed and is simply a question of availability. Wordfeud FREE can be downloaded for free from the Google Android Market. Pay $2.99 to purchase the full ad-free version. In the free version, a full-screen ad is displayed after every move and there is a small ad banner at the bottom of the main screen.